If you’re a keen gamer, looking for new challenges, then of course there are plenty of free offerings available online. But which sites or services are the best for you? It might take a while to find out. And so it could be easier to install JogoBox, a single tool which makes it easy to find and play thousands of free games, no registration required. Launch the program’s tiny (331KB) installer, and within a few seconds the client is ready to go. The program’s opening screen highlights “Featured”, “Popular” or “New” games, and you can browse various categories -- Adventure, Brain, Fighting, Girls, PC Games, Racing, Skills, Sports -- or directly search the JogoBox database for your favourites. Some of these games are, well, just as you’d expect. Look through the Brain category, for instance, and you’ll find Flash versions of Tetris, Mahjong and Bejeweled, amongst other old favourites. Click Play and the program will play an ad occasionally (JogoBox is ad-supported, but this wasn’t too much of a hassle during our trials), before opening a browser window to download the relevant applet. What’s more interesting, though, is the PC Games category, which contains real classics: Sid Meier’s Civilization, Command and Conquer: Red Alert, Wing Commander, UFO: Alien Invasion, Warcraft: Orcs and Humans, Transport Tycoon Deluxe, and many more. You can find similar links to ancient DOS games elsewhere, of course, but JogoBox really is different. The program has packaged these games with DOSBox, so if you download Command and Conquer: Red Alert, for instance, there are no installation or setup issues to worry about. As soon as the download is complete, it just opens in a window, ready to play immediately. On balance this probably isn’t the best solution for finding Flash games, then. We’d prefer to spend a little time browsing some of the many free game sites out there, which could also help to avoid the more intrusive adverts. 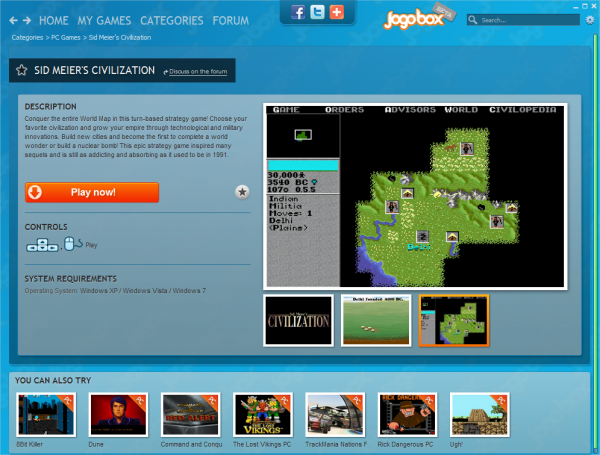 JogoBox is a very useful tool for finding old PC games, though, and getting to play them without the usual hassles. And if that interests you at all then the program is definitely worth a few minutes of your time.